Courchevel is the most popular and luxurious resort in French Alps. Currently, the ski resort of Courchevel in France is a world-recognized ski center, able to satisfy all the requests of fans of skiing. In Courchevel for every tourist there are suitable trails. For those who wish to ride in the cleanest untouched snow, there is a helicopter delivery to inaccessible beautiful places. Where is Courchevel? There where are pure untouched snow, purest mountain air and a sea of fun and entertainment. 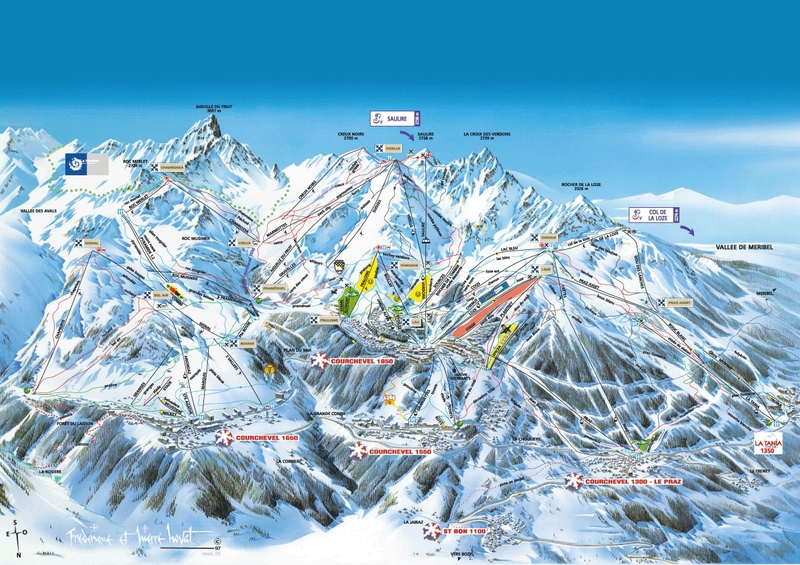 Courchevel is the pearl of the Three Valleys - the longest ski area in whole Alps. The resort consists of five resort villages located at different heights: San Bon (1100 m), La Pra (1300 m), Courchevel-1550, Courchevel-1650 and the most prestigious resort of the world - Courchevel-1850. All these cities are connected by a free bus service, so getting there from one part to another is not difficult. Courchevel is a universal resort that is suitable for families, for active tourists and for those who prefer measured lifestyle. The beauty of nature, crystal mountain air - all this fills you with life and energy, gives positive emotions. Amazing photos made in Courchevel will remind you of an unforgettable vacation, and beckon you back! There are no direct train connections to the resort itself. If you’re traveling by train, Moutiers Train Station is the closest station to Courchevel. Moutiers is easily reachable by national and international rail services. Alps2Alps transfers are available to take you to Courchevel. All of the above will only lead to the fact that our base rate for transfer services will decrease - we never overstate our prices at any time. We also offer you very good discounts for mid-week transfers to Courchevel. If you are looking for the best deals, keep in mind that traveling outside the peak season or in the middle of the week will let you save the most. Alps2Alps are ready to offer you the best shares up to 60% on transfers from Monday to Monday. The final cost of your transfer will also be affected by the following factors: availability of the car, transfer schedule, other expenses, such as tolls and parking fees at the airport. Please contact us directly if you have any specific requirements for your future trip so that we can discuss your requests. The Three Valleys ski area is the biggest interconnected ski area in the whole Alps. These resorts accessible to skiers of all levels of expertise. There are 50% of easy slopes, but it is also a good place for profs to improve their skills and to step up the level of skiing. In Courchevel you are welcome to discover the all parts of Three Valleys and be sure - you will find exactly the right pass for you. Courchevel meets all the needs of the most discerning tourists traveling with children. On the territory of the village, there are three kindergartens (with additional branches for children from 3 to 12 years old), playgrounds and even a special school for young skiers - ESF Courchevel. Its branches are located at all the main stations of the Three Valleys, and the most qualified instructors are always ready to help little tourists learn the basics of skiing skills. In addition to skiing, there are small sleds, dog-sleigh rides, indoor pools, special children's menus with gifts in cafes and restaurants, as well as animation performances specially designed for foreign-speaking guests are available for small visitors. Courchevel is a very famous place in itself - in walking distance are collected entertainments for every taste and purse with a lot of opportunities to enjoy your holiday. Here you can see a lot of bars, discos, bowling clubs and billiards. For those who prefer more refined pastime, there is a modern concert hall, several cinemas, libraries and art galleries. Alps2Alps are at your service if you plan to spend your vacation in Courchevel - this is the best way to start. Fortunately for you, we have covered you. You are welcome! As always, the best offers for popular transfer destinations during peak season are growing rapidly, so - hurry up! We always advise our customers to book the transfer to the ski resort as soon as possible in order to avoid disappointment. Go on an unforgettable vacation to the Alpine fairy tale - order your ski transfer to Courchevel right now! If you can’t find the information you need, please contact Alps2Alps customer service team today. We will be happy to help you, just call.